Slip on the track about 10 mins from Fenceline carpark requires care to cross. This used to be an easy 40 minute return walk along a relatively flat and grassland area from the Fenceline carpark at Otaki Forks. The Waiotauru Walk continues along the river and is a longer route for more experienced trampers. 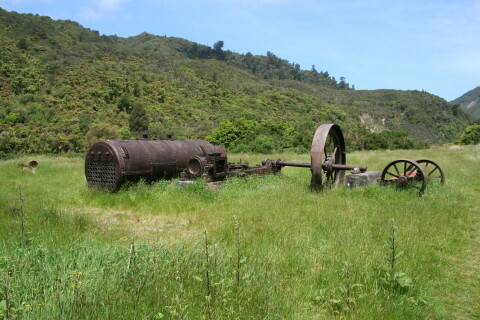 However, the historic 1930's remnants of the boiler and other machinery are on display on the grassy area which is an excellent summer picnic spot. Unfortunately, there has been a slip on the track midway between the fenceline carpark and the sawmill. The route across the slip is open, but extreme care is needed and is best attempted by reasonably fit people with good footwear. Fenceline carpark, 1.5 km south of the caretakers house at Otaki Forks.